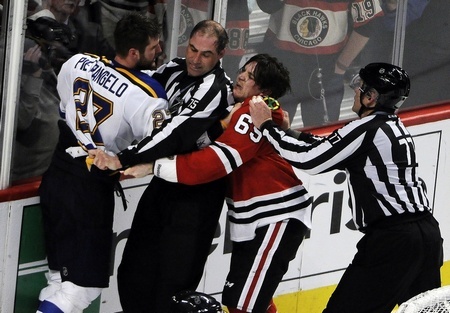 Chicago Blackhawks forward Andrew Shaw has been suspended for one game and has been fined $5,000 for his actions during Game Four of his team’s series against the St. Louis Blues. The incident took place on Tuesday night in Chicago at 17:56 of the third period. The 24-year-old was suspended for the use of a homophobic slur. The fine was for an inappropriate gesture directed toward on-ice officials. The suspension includes some sensitivity training for Shaw. Shaw expressed remorse on Wednesday, stating that the behaviour was not indicative of his character. Shaw’s remarks came before the announcement of the suspension and he said he watched video of the incident when he returned home after the game. Team captain Jonathan Toews stated that the situation could be a teachable moment, with more attention required to “scrutinize” these sorts of situations more. Shaw has four points in four games for Chicago, plus he’s had nine shots on goal. Most in the NHL community resoundingly condemned Shaw’s actions and behaviour, including Don Cherry, and this does seem to be an issue that the league is prepared to take on. The partnership formed with You Can Play has shed some light on the matter and that’s a good thing.